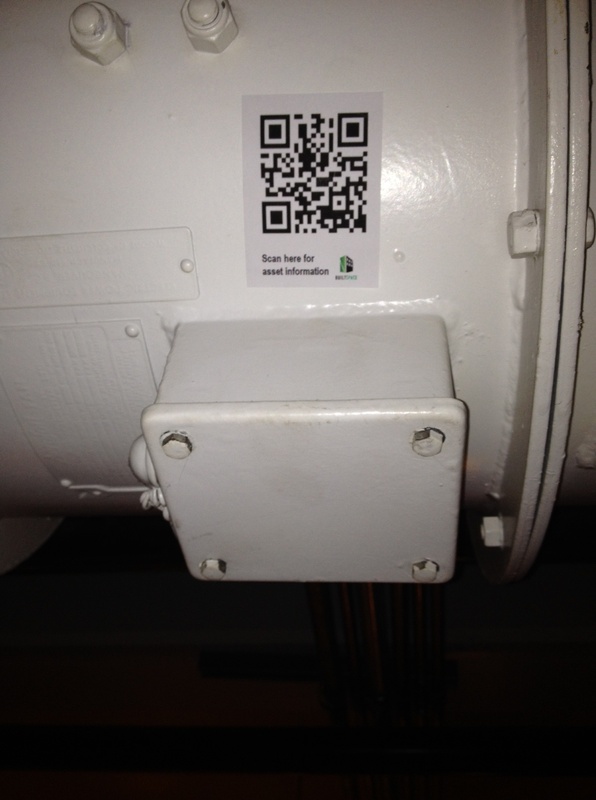 Strategically placed QR codes permanently placed on equipment can simplify asset management, especially when operations and maintenance responsibility for assets are shared by facility staff and multiple service contractors. Weekly visual inspections by the building operator are recorded, using his Smartphone, by scanning the QR tag, which identifies the equipment, date, time and operator. Completing a simple inspection form, with minimal data entry, the operator quickly assesses and confirms equipment condition. On this inspection, the operator notices an issue, and flags the equipment for service. He takes several photographs and attaches them to the Service Request. The Service Request, with equipment uniquely identified by the QR code, is electronically submitted for approval, following standard operating procedures, then forwarded to the attention of the service contractor, now as an approved work order. The service contractor, now with detailed knowledge of the equipment, including photographs, as well as service and inspection history, dispatches a service technician to site, with appropriate spares. Arriving on site, the technician, with his tablet or Smartphone, scans the QR code on the equipment to display the Work Order, confirm he is at the correct equipment, review service histories, and access equipment manuals. He completes the repairs, adds labour, parts, and incidentals to the Work Order, then submits the completed form. Details of the work completed are immediately updated in the database, and the technician’s Work Order details are electronically directed back to the service contractor’s dispatch system for invoicing. Both building owner and service contractor enjoy significantly reduced costs, reducing data entry, and improving the quality of their building records. BuiltSpace has created the shared, building centric information management system, with advanced multi-level role-based security, the ability to integrate with multiple systems, and QR codes that makes this possible. « Scan. Fix. Save. Using QR codes to improve tenant service.